CRAZY DISCOUNT! Was: $449.95 Now: $199.98! 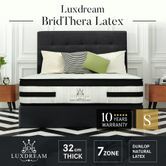 Enjoy maximum comfort and support when sleeping with a premium Luxdream Natural Latex Foam Mattress 7 Zone Eurotop Pocket Spring 32cm Thick! 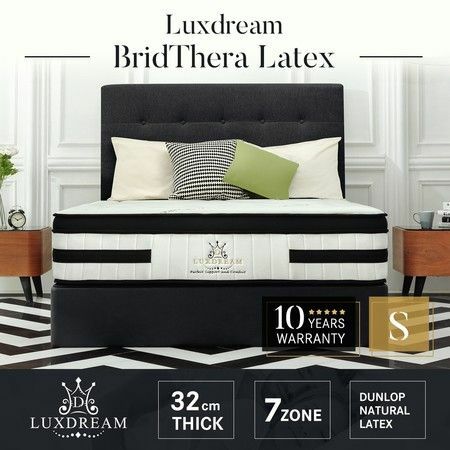 Made of 100% Natural Dunlop Pin-Core Latex Foam, 100% Organic Cotton, the Luxdream mattress possess a distinctive feature known as more breathability, eco-friendliness, and safety. Coupled with flexible pocket spring, advanced euro top, 3-layer convoluted foam, this quality mattress can only be found in ultra-premium mattresses that cost over $1,500 for a queen mattress. The Sleep-On-Latex design team carefully crafts this natural latex mattress for comfort, beauty, durability, and ease of use! Look no further than this bed mattress with perfect quality and perfect price! --- Natural latex is inherently anti-bacterial and anti-microbial, follows the contours of the body, providing correct support and superior comfort. The pin-core holes allow it to breathe freely for maximum air circulation. --- Advanced precise support and years of no-sag pressure relief comfort, including the conforming cushion. ---The cover fabric is made of organic cotton blended with hypo-allergenic fibers, gentle to the skin. Anti-bacterial & anti-mite, soft and eco-friendly. Love this topper. I have a way too firm mattress and this topper was perfect to cushion all the pressure points. Nice to wake up not feeling like a cripple from all the aches and pains and way less expensive than investing in a new mattress. Plus as I can afford it later I am thinking of buying a latex core to use under this topper and making a diy mattress. This topper helped our bed so much. It went from hard to comfortable right away. Never should have waited so long to buy this. My shoulder and hip now have something to sink into without the bed feeling mushy. Love my mattress gives me a totally different sleep for the better. No more aches and pain when I get out of bed. It delivered sooner than expected which worked out great Package was rough around the edges which was expected due to the weight but mattress itself was really well protected. No smell when took off the plastic and it expanded really fast I would definitely buy it again.